Plot: Product Description: Stevens, is the perfect English butler at the stately home of Lord Darlington. Stevens’ highly ordered life is ruffled by the arrival of a lively new housekeeper, Miss Kenton, and the encroachment of apparently pro-Nazi appeasement politics as the 1930s come to an uneasy close. I love this movie. It’s a film that has flawless acting and superb direction. The whole movie comes across as a classic of cinema. The atmosphere of the feel lends to the emotional makeup inside us all. The drama mixed with a slight comedy and romantic overtones, creates a memorable memory after you watch this piece of cinema. Anthony Hopkins, what need to be said about this genius of performance? He is and always will be one of those actors that not only creates the part, but becomes the part and the part of Mr. Stevens in this, is no different from that reality. I first saw this when it came out. I remember going with my mother to the theater to see it and instantly falling in love with it. I was so happy to see the announcement by Twilight Time that they were going to be bringing this film out. As always Twilight Time has done a fantastic job at showcasing the brilliance and mastery of a Blu-ray product, that in my humble reality, is a must own Blu-ray. The Remains of the Day is from one of my favorite authors that I grew up reading. Kazuo Ishiguro is a master at words and telling a story that utterly floors you, and sticks with you, deep within you. If you have not read his work, I plead with you to do so, it will change your reading mind, on just how great an author can be. 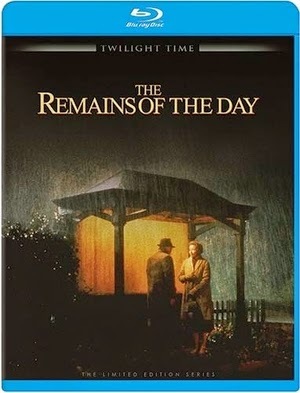 The Remains of the Day was his third novel and one of my personal favorites. I had read the book before seeing the movie and both are amazing experiences. Now for any true movie lover and movie buff, The Remains of the Day really needs no introduction on just how great it is. It has a flooring cast of prime, top notch actors and actresses. From the brilliant James Fox, to the one and only, Christopher Reeve. Also Hugh Grant and the wonderful Ben Chaplin. But the two main stars that dig deep into you is Anthony Hopkins, and the stunningly beautiful, talented, extraordinary actress, Emma Thompson. The chemistry displayed by all in the film is what great cinema is all about. Emma and Anthony, can’t be put into words at how great they are in this film, and how great the film is period. Like most film adaptions of novels, it differs in certain spots, but still maintains the beauty and majestic persona of the book. The movie has won great accolades from critics of all walks of cinema. It was nominated for 8 Oscars which sadly it did not win any because at the time period, there was too many wonderful flawless films, that it had to compete against. It was up against, Schindler’s List and also The Piano, and Philadelphia, which those three took the awards for, Best Actor, and Tom Hanks rightly deserved it, even though Hopkins did also. Best Actress went to the amazing Holly Hunter for The Piano. Best Direction and Best Picture and Best Writing went to the utterly, heart breaking and flawless masterpiece of cinema, Schindler’s List. The Remains of the Day deserved the nominations, and deserved the wins, but at the time it just had too much to go against. This is directed by a director that has often been overlooked and never given the credit that he so rightly deserves. When it comes to the greatest directors of all time, James Ivory is without a doubt one of those. Where he belongs on the list is everyone’s own choice. Ivory is a director, that all upcoming film makers and even stable film directors, can look to his body of work and learn from it, in how to create film, that stands out, is structured flawless and displays itself in memorable ways. Just to name a few, 1985’s, A Room with a View, 1987’s, Maurice, and so many wonderful others. Ivory has had a long and amazing career. Twilight Time has honored this film making genius with a beautiful Blu-ray, and a top notch transfer. Ear candy in the audio, and vibrant beauty in the video. Ivory often used many of the same actors in different films, including Anthony Hopkins and Emma Thompson. Anthony was in four of his films. Others who often returned under his direction was, Hugh Grant, Christopher Reeve, the stunning and utter beautiful Vanessa Redgrave, and many others. Ivory’s expertise, shines with The Remains of the Day. His direction is like a living creation. You often find yourself forgetting it’s a movie. The film with its tight, solid direction, costumes, atmosphere and most of all acting, places you inside the time period, and the story taking place. Simply put, the book comes to life, and you become a part of the pages unfolding on screen. Ivory has that way with you in his films, and in this adaption of an amazing story into film form, is no different. Ivory’s expertise alongside his longtime partner, producer and director, Ismail Merchant created films that shined, which went on to be nominated for countless awards. Their ultimate completion of films, would win them 6 Oscars in their career's. Amazingly Ivory and Merchant’s partnership, both as lovers and film makers, lasted over an amazing 40 years. Merchant sadly passed away in 2005. That partnership led to many wonderful films that stand out. Dozens and dozens and more dozens of films shined with their talent. Their films transcended importance, often time showcasing social commentaries and certain ways of life, always inside a part of history. Both Ivory and Merchant are iconic persons inside the world of LBGT –Lesbian, Bisexual, Gay, and Transgendered- for they were and are, two successful gay men that was able to capture flawless cinema throughout the decades, and showcase that reality in certain of their films such as, Maurice. They are roles models and pioneers of cinema, and many look up to them, and rightly should. One of my favorite things about this film is the underlining subject of World War 2 and the ideas of the Nazi Party. Anthony Hopkins plays the butler perfectly, in the idea of the basic personality of the time period, where they ignored the coming storm. Hopkins character simply would not say, or speak up about the situation, he was clearly there to work and serve. His persona is like a lot of the countries that gave into Hitler, they simply went a long. Because of that, morality took a back burner, and persons enter a blind following, allowed Hitler and the Nazi party to rule bringing the world to the brink of madness, horror, and uncountable amounts of murder. That is one of the strongest subjects of the film, the growing relationship between James and Miss Kenton. The budding, playful and comical growing emotions. There is one shot when Anthony’s character is reading, and Emma’s character wants to know what the book is, and he won’t tell her. When she continues to pry and gets closer and closer, the emotional expression on Anthony’s face, glancing at Emma. A flawless moment of acting, not by words, but by facial expression and the growing tension. This is one of the great stand out moments, just like the whole film. The emotional reality in Anthony's eyes is unbelievable. The tight tension and romantic wanting, showcases the flawless acting by the two. Watching this and seeing Christopher Reeves, is always brings a heart pain for me. To think he is no longer with us. My one, true Superman. He, like all involved with this film, gave some of the best acting ever. Another aspect of this film that is flawless, is the cinematography by Tony Pierce-Roberts. A stunning example of another flawless reality to this film. Roberts’s photography is breathtaking. The Remains of the Day is a film that showcases excellence in cinema. A must see and must own, cinematic gem of high class, amazing storytelling, and thought provoking film making. This has never looked any better. Twilight Time’s transfer on Blu-ray created a whole new way to experience this movie. It looks amazing. Not even in the theater, did it look this great. The colors are vibrant, and the imagery is stunning to look at in a whole new way. The sound is no different. Something I love about Twilight Time Blu-ray, is the perfection and quality given to the films. Beautiful ear candy. Audio Commentary by the man himself, Director James Ivory, also alongside his partner and producer Ismail Merchant and the beautiful Emma Thompson. This was a great listen. Loved hearing everyone speak of the film. This was the first time I had ever heard this commentary, and so it was an excellent treat, to this movie persons mind. Isolated music score. This is an amazing special feature, because the person behind the music is truly a god when it comes to music. A common music composer on many of Ivory and Merchant’s films. To name some, Roseland, The Europeans, Jane Austen in Manhattan, Heat and Dust, The Bostonians, A Room with a View, Howards End, which he was nominated for an Oscar, and many, many others. He also did other films, but it was his continuing relationship with Ivory and Merchant that he will be known for. He left a world of cinema filled with amazing sounds. A composer that shined and made you experience the film in whole other ways, and The Remains of the Day is that prime example of his mastery, at the craft of music. The Remains of the Day: The Filmmakers Journey. This is program that has the author Kazuo Ishiguro, along with the Director James Ivory and producer Ismail Merchant, talking about the production, and how the film came together through the task of owner ship and legal rites. Very informative piece on the film. Running time of 29 minutes and 52 seconds. Blind Loyalty, Hollow Honor: England’s Fatal Flaw. This is a good program on the time period and the ultimate mistakes taken. It showcases the historical reality of Germany and there ultimate rise to power, and how the Lords, and high and mighty aristocracy, brought on the war. You get to see the writer, actors and director, plus the wonderful Christopher Reeve, talk about the time period, and the horrors that was to be Hitler. Running time of 14 minutes 51 seconds. Love and Loyalty: The Making of The Remains of the Day. A nice behind the scenes program during the filming. The director James Ivory, Anthony Hopkins and Emma Thompson talk about the experience. Running time of 28 minutes 36 seconds. Deleted Scenes, running time of 14 minutes 27 seconds. Theatrical Trailer running time 2 minutes 23 seconds. International Trailer running time of 2 minutes and 44 seconds. Also the wonderful, amazing, little booklet by film historian Julia Kirgo, always a true treat to these products. Priceless film that never gets old. It’s a movie that showcases how to make a perfect film. Flawless acting and direction. A perfect product by Twilight Time. This is a Blu-ray that needs to be owned and showcased and spread for its ultimate beauty. This is a Blu-ray that gives the fan and lover of cinema, everything that is great, about the movie experience.